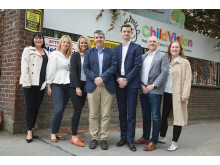 GroceryAid is the national charity that helps people across the whole of the grocery industry. 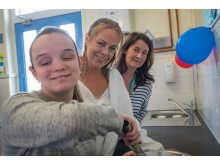 The Charity revealed it is organising GroceryAid Day, an awareness initiative set to take place for the first time on Tuesday 26 February 2019. 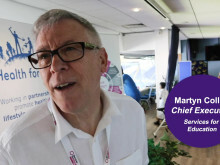 The annual event aims to make everybody who works in the grocery industry aware of the practical, emotional and financial support available to them. Winterbourne House and Garden welcomed over 1,300 visitors to celebrate the Health, Horticulture and Heritage Festival, with inspirational healthy living activities and experiences for the whole family. Mondelez International were proud to sponsor the event and bring the Premier League trophy to the festival through our Cadbury partnership, whilst our Green and Blacks team hosted a chocolate tasting demo. 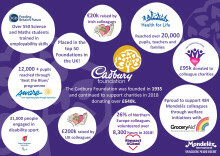 Mondelez International has supported Grocery Aid for many years through The Cadbury Foundation and in 2017 supported 450 current and former colleagues through welfare initiatives. 40 cyclists, 200km and 400 hours all for local charities! ​Colleagues from the UK donned their lycra on Friday to cycle from our Bournville site in Birmingham to our Marlbrook site in Herefordshire - and back again! 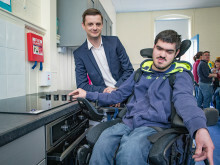 Sandwell Advocacy, a charity committed to supporting vulnerable people, has been given a face-lift thanks to employees at Mondelēz International in Bournville. 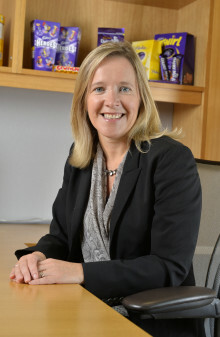 Mary Barnard President, Mondelez, UK I have the privilege of being the guardian of one of Britain’s most loved brands, Cadbury, the nation’s favourite chocolate. I am also the UK’s number one fan of Cadbury Dairy Milk Caramel. 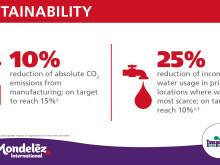 But most importantly I’m a representative of the thousands of people that are proud to work for Mondelez in the UK. 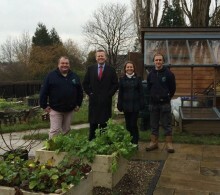 Newly appointed Birmingham Chamber of Commerce CEO Paul Faulkner and Director of Policy & Strategic Relationships Henrietta Brealey visited one of our Health for Life growing sites in Weoley Castle earlier this week, to find out more about the programme, our involvement and meet the team. Our award winning Health for Life programme has gone from strength to strength this year! 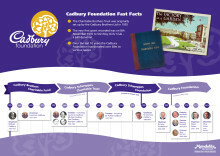 Celebrating the impact of The Cadbury Foundation in 2018! 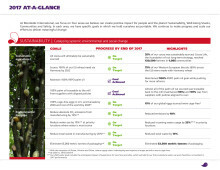 The MDLZ Progress Report edition 2017 details progress against our sustainable agriculture and environmental footprint goals to fight the impact of climate change, the growth of individually wrapped portion control snacks in our portfolio, our solid safety record, as well as the expansion of our healthy lifestyle and nutrition programs in at risk communities.